INDUSTRY.co.id - Jakarta - Since 2002, with the first outlet in Plaza Indonesia, Jakarta, Starbucks has become a part of Indonesian society. Currently with over 300 outlets in 22 cities, Starbucks is a place for customers to share stories with others. 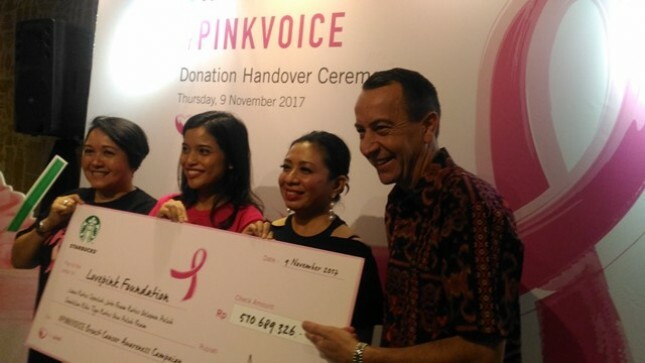 Commemorating the Moon of Breast Cancer last October, Starbucks with LOVEPINK (Foundation of Daya Dara Indonesia), and a non-profit breast cancer care foundation, through the #PINKVOICE campaign supports everyone to voice the issue of breast cancer. Starbucks is committed to donate 10% of its sales from Pink Beverages, launched in October to support Lovepink's mission. "The #PINKVOICE campaign received such a positive response and great anthropism from the community. More than 200,000 Pink Beverages sold and contributed Rp 500,000,000 to support Lovepink programs and activities in raising awareness of breast cancer topics and the importance of conducting routine checks as the main preventive measure," said Anthony Cottan, director, Starbucks Indonesia. The results of a Lovepink survey initiated with Prodigy (communication consultant), and MARS (independent survey institute) in September found a shift in the age group of young breast cancer patients (30-40 years) and detected at an advanced stage. These patients assume no risk of breast cancer so careless and do not take preventive measures such as BSE (Check Breast Self) and SADANIS (Check Clinical Breast) on a regular basis. Lovepink also found the issues faced by survivors outside Jakarta include lack of extension / seminar activities on breast health and the importance of routine breast cancer awareness; as well as the cost of expensive and minimal medical personnel and health facilities in the health center or hospital.